Point Guard Drills - Control, Control, Control! You are here: Basketball Coaching / Basketball Drills / Point Guard Drills – Control, Control, Control! Point Guard Drills – Control, Control, Control! Your point guard’s ability to read and react to the defense might be their most important job, but with this influx of scoring guards in the NBA – Derrick Rose, John Wall and Russell Westbrook for example – I’ve seen way to many kids that just fly down the court as fast as they can in an attempt to emulate these superstars. That’s why it’s important to drill the mental aspect of the point guard’s position just as much as ball handling and passing – what use is a great handle if your player doesn’t know what to do with it? 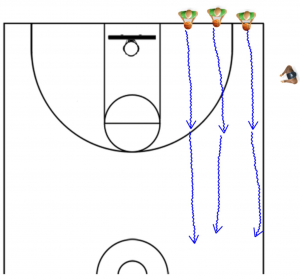 Here area a couple of drills that will teach your point guards that patience and a change of pace can make their jobs quite a bit easier. One mistake I see young players make all to often is to attempt to blow by the trap when they see it coming, charging in at full speed. This is exactly what the defense wants you to do. 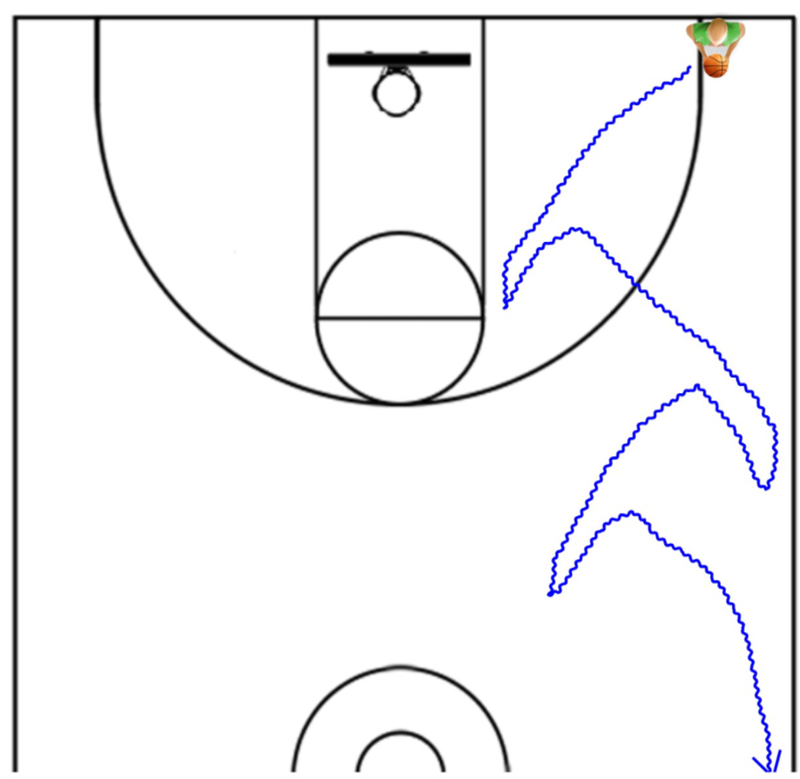 In this drill, your player will start off in a corner of the court, and dribble directly out to the elbow. They will then come to a stop while keeping their dribble alive, step back, cross over, and explode in the opposite direction. Instead of running right into the trap, your point guard can pull out in control, and exploit the defenders for over committing. While I prefer to start this drill off with no defenders, and just have my players escape imaginary traps as they dribble down the court, once they’re comfortable with the maneuver, having actual defenders at the elbows and half court line will get your players more ready should this situation arise in a game. This is a great drill for showing players how to run at a top speed while staying under control. Have your guards all line up on the baseline, and on your whistle, they will speed dribble down the court as fast as they can. However, on your second whistle, which you can blow whenever you choose, they have to come to a complete and balanced jump stop – any player that loses his footing or the ball will have to restart at the baseline. This drill is at it’s most effective when it is a competition, as otherwise players will stay well within their comfort zones as they bring the ball up. 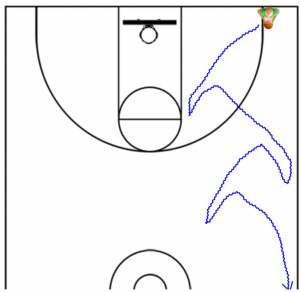 I hope you found this useful, but if you’re looking for more point guard-centric drills, make sure to check out this post on how to handle full court pressure! 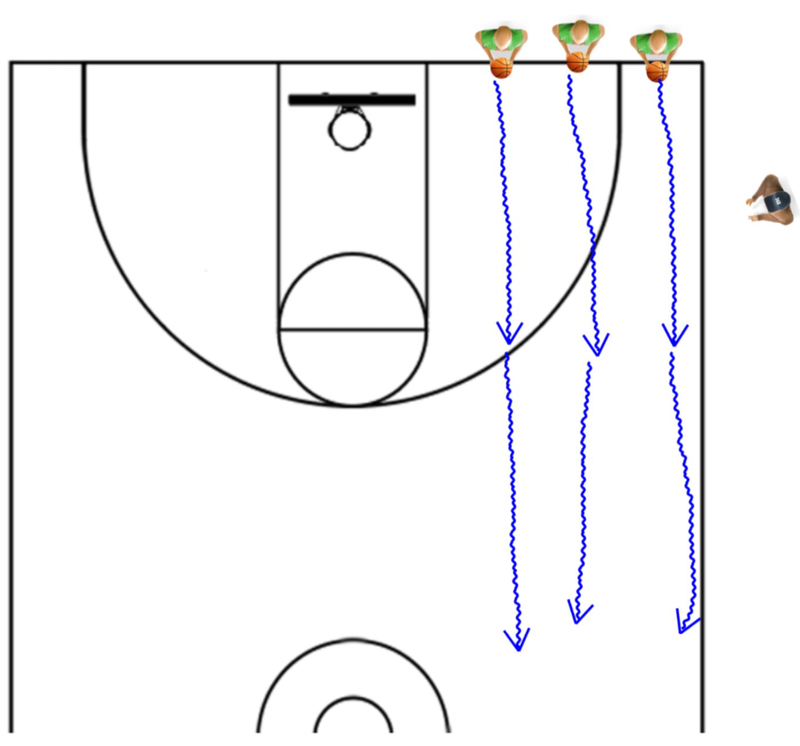 Most of our drills are great for all ages, but I’d suggest sticking with more basic drills like this one: http://www.online-basketball-drills.com/basic-basketball-drills-and-skills-dribble-chicken-0923 (but you can make it even more basic by just pairing the kids up and having them copy each other’s dribbling moves).